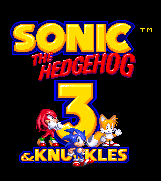 Sonic & Knuckles levels are intended to pick up right from where Sonic 3's left off, and there is little difference in their brilliance, as they're both designed with the same ethos. The huge (perhaps even bigger) stages are rife with non-linear paths that branch out into sub-routes and secret areas, all of which could never legitimately be covered in one sitting. 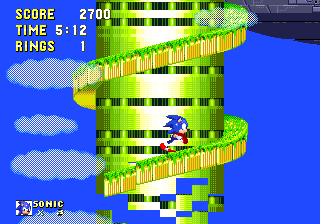 As with Sonic 3, two acts of one zone don't just stay the same but evolve in every aspect, be it the beautifully crafted scenery, the excellent background music, the structural features and the inventive objects and enemies you encounter. Though the majority of the levels are available to both, the two characters frequently indulge in their own exclusive routes on numerous occasions, thanks to their specific abilities, such as Sonic's higher jump or Knuckles' ability to more easily knock down barricades. 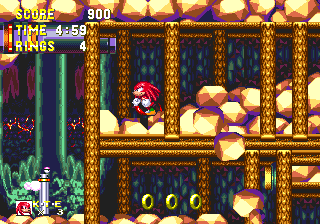 As a rule, the challenges and bosses that Knuckles faces are just that little bit tougher. Technically there are seven levels to explore, though unlike most titles in the series, their lengths and contents can vary dramatically as the latter half of the game begins to introduce more story-focused scenes into the levels than ever before. Like all of those in Sonic 3, the first four are divided into two large acts, each with a boss at the end of them. 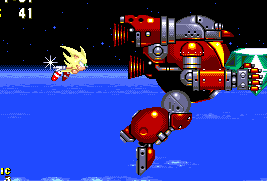 The first act boss will usually be a large robotic henchman of Eggman's, while Sonic will battle Doctor Eggman himself at the end of the second act. Knuckles meanwhile usually tackles an Eggrobo badnik, taking Eggman's place. The fifth and sixth zones however feature only one act apiece, in which the rule book is thrown out entirely. Hidden Palace Zone for Sonic is used purely as a scene in which the plot of the game takes a dramatic turn, and for Knuckles it's bizarrely no more than a very short walk indeed. 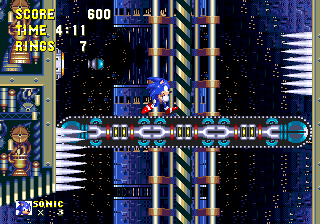 The single act of Sky Sanctuary Zone throws a series of boss battles at Sonic amidst a vertically progressing level, whereas for Knuckles this acts only as the stage for his final battle. Only Sonic has access to the last, full two act level in which he boards the Death Egg once again. 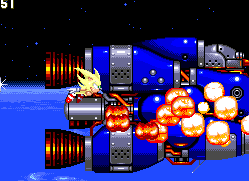 If he collects all seven Chaos Emeralds along the way, there is also one last, epic boss battle to encounter that can only be played as Super Sonic, thus kick starting an extremely common trend in later Sonic titles. So although Knuckles' levels are a tad harder, his overall game is cut short by quite a bit. If you thought there was too much water in Sonic 3 (present in five out of the six levels), you'll be pleased to know that S&K balances this out by having absolutely none whatsoever. There are, however, a few more death drops littered around the place. Also, because these games are supposed to be joined at the hip, the difficulty level is brought up a notch or two, in order for it to gradually rise throughout the whole range of thirteen levels, when playing Sonic 3 & Knuckles. Death drops? Is that when you fall off the bottom of the screen? @Anonymous yes, also known as a bottomless pit. 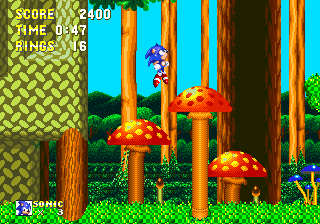 After the events of Sonic 3, Sonic falls back down to Angel Island, finding himself in the hidden underworld of the island's deepest woodland forest. Massive wild mushrooms and colourful plants grow plentifully and there are long, twisting tree-vine pathways to speed across and occasional strong winds to endure. Different areas of Act 2 are magically themed on different seasons of the year in this classic stage. What's this? A flying fortress level so early in the game? 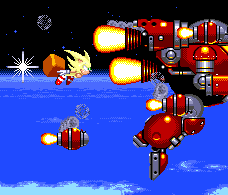 Casting a dark shadow over Angel Island, Flying Battery is Robotnik's mighty prison and battleship, and though it has one or two nasty external areas, it mostly takes place inside, where it's actually more of a large, mechanical arena zone. There are an absolute tonne of different traps to overcome and features to use, including the typical end-of-level prison capsules, famously located all over this level and containing various items other than just trapped animals. A mix of speedy, puzzle-based and platform-hopping areas to navigate your way through. Flying Battery has taken our heroes to a dry, isolated desert region of the island, home to ancient Egyptian buildings and artifacts. Act 1 takes you through the sunset labyrinth of crumbling structures, where sand slides, crushing blocks and quicksand are the order of the day. Act 2 is based solely inside a huge pyramid - keep it well lit to prevent the ghosts from appearing, and doors only open when you press against timed switches, closing slowly while you make your way towards them. One of the most puzzle-based levels ever, with all kinds of traps and tricky features. A long and difficult zone for any player. Sonic drops down into the molten caves, deep inside the volcano that the Death Egg crashed into, and you can see it looming over you at the top of the stage. Act 1 is quite a fun, lively network of rocky tunnels and pits of bubbling lava. The calmer Act 2 brings with it one of the most significant mid-level changes ever, as the molten rock cools and forms glowing icy crystals, sitting alongside the lava lakes in miraculous harmony. 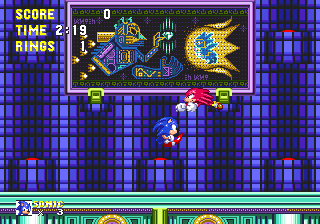 There's a completely different style and atmosphere in these more deadly ice caverns, loaded with traps as Sonic and Knuckles move ever closer, albeit in mostly separate routes, to the Master Emerald. It doesn't take Eggman very long to throw the Master Emerald into the Death Egg and launch it once again. 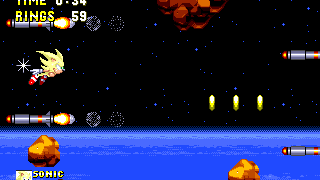 Sonic and Knuckles' best strategy is to intercept it on the way up, so they come here, to Sky Sanctuary. 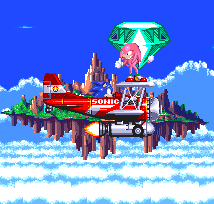 This is a collection of crumbling ruins, once a grand Echidna metropolis, that now hovers precariously in pieces high above the island, thanks to the Master Emerald's power. 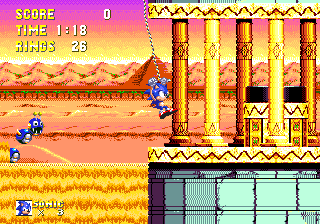 The ruins are beginning to collapse without it though, plus Eggman has an ace up his sleeve, sending an old, but revamped nemesis to hinder our hero throughout the level. Knuckles doesn't have a stage to play here, instead, this is the battleground for his final boss of the game. This is the first ever "extra boss", the final challenge of the game featuring Super Sonic, which has become a very strong tradition in Sonic games ever since. This is ONLY playable as Sonic, having collected all of the Chaos Emeralds. This also goes for Sonic 3 & Knuckles, but if you've collected all of the Super Emeralds as well, you'll be playing it as Hyper Sonic. Doesn't make a lot of difference though, except in the ending that it yields. 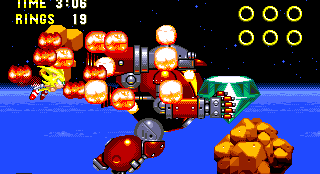 Even though Sonic managed to nab the Master Emerald back at the end of the final boss, Eggman somehow still has it, and has made off with the shiny rock in his mech and escape pod, leaving the ruins of the crumbling Death Egg behind. Sonic leaps into action and transforms into his super form and begins his pursuit across space, inconveniently through an asteroid belt. First of all, let me run through the rules. 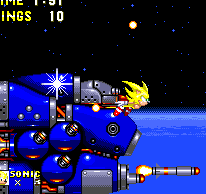 You control the airborne Super Sonic using the up, down, left and right buttons to move him across the screen, as he proceeds rightward, with objects flying toward him. Areas above and below you can be explored beyond the vertical height of the screen, but you can't go very far before you hit a limit and can't go higher or lower. You can also press A, B or C to dash forward, or in the direction that you're holding on the D-pad. 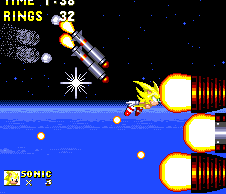 Super is invincible, except for the fact that, as always, your rings deplete at a rate of one per second. 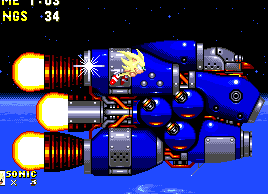 You begin with 50, and can collect a load more during the first and third phases of the boss, but if you let your count hit zero, you'll return to regular flavoured Sonic and he'll fall and die immediately, returning you to the start. In the last ten rings, the music tempo will increase, to make you aware of your predicament. The trick is to grab as many extra rings as you can, land your hits quickly and make use of that forward dash. For the first phase, Eggman is no where in sight because you're still catching up to him, so this is an exercise in ring collecting. They'll mostly appear in groups of three or six (though there are larger groups occasionally hidden at the top and bottom of the area), and they come and go pretty quick, so my advice is to try and keep to the left side of the screen, so that you have maximum time to get into position. You'll also want to dodge quite a few asteroids heading your way too, which will break and slow you down a little if you collide with them. They vary in size and speed, but the big ones are the most dangerous. What you really want to look out for though are the less common, but faster and more deadly missiles being fired at you by the doctor, just ahead. Smack into one of these, and you'll be sent spinning backwards for a couple of seconds, reduced to minimum maneuverability. At about the 30 second mark, a series of parallel pairs of them will appear, leading upwards, and then down, to create a kind of winding tunnel of missiles. If you dodge them so that you stay in between the pairs, you'll be rewarded with groups of three rings between each pair, so it's well worth attempting to go through. I usually end this phase with around 90-100 rings, which is plenty, but the more you have, the more time you'll be able to spend beating Eggman in the second phase of The Doomsday. After a minute of play, the second phase begins. 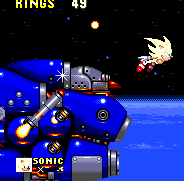 All the asteroids and rings are gone, and Super Sonic catches up with the doctor's mech, which is looking far smaller, as it sits in the cockpit of a large blue escape pod. The pod is armed with three circular gun turrets in its centre that are constantly locked on to your position and regularly spout small projectiles heading your way at a fairly fast rate. Colliding with one of these produces the same effect as the missiles in the first phase, so avoid them as best you can. Go near the lower right hand side of the pod and it will release three missiles at a time. These ones don't move incredibly fast, but they home in on you, and again, will explode and knock you backwards when hit. In order to attack the boss, you have to guide the missiles into the cockpit by flying close to it. While it's heading for you, it'll collide with the mech and explode, causing a hit. Make all three missiles explode, either by damaging the mech or by hitting them yourself, and another three will be released, once you get near the right hand side of the pod. This phase can be quite tough, because there are so many things being thrown at you, and you really need to do it as quickly as possible. What I usually do is move in a circular motion around the pod, staying quite close to it, but try not to stay still for too long. To best avoid those annoying little projectiles, use your dash, by pressing A, B or C. The missiles will remain pretty close to you throughout, so you shouldn't need to stay near the cockpit for very long. After 8 hits, the pod begins to explode and tumbles downwards, out of view. This costs about 10 valuable seconds, and ideally, you'll want to have beaten the pod with more than 30, or at least 20 rings left. 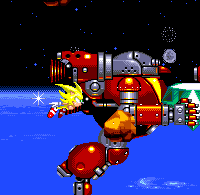 To signify the third phase, Eggman's mech will blast right past you, clutching the Master Emerald for dear life in a final, futile effort to escape. 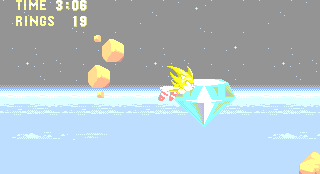 Since the Master Emerald is the same size as normal, presumably this is a deliberately miniature version of the already-disposed-of giant mech, and not just an odd perspective thing. The rings and asteroids return here, so if you're low on rings, I'd strongly recommend forgetting about Eggman for the moment and concentrating on refilling, although they're a little more scarce this time around. As the phase begins, stay in line with the very edge of the planet in the background, to collect the first 6. When you're ready, use your dash to catch up to the mech, which is flying a little ahead of you. Beware though, because it'll blast out a series of new, red missiles that fall backwards, and have the same effect on you as the other missiles and projectiles, though they don't remain in a straight line and are harder to dodge. Along the bottom, it'll also regularly produce little blue spikeballs that also slow you down. Just keep tapping that dash button though and aim to hit him on the body, just by touching it. Eight of these should put this machine down forever as it begins to explode and fall, losing its limbs along the way. In a flash, Sonic scoops up the Master Emerald, we fade to white and the day is well and truly saved at last! LiQuidShade: What do you think of the Doomsday Zone music? Complete this battle as Knuckles, and some pretty funny things ensue. But I won't spoil it for you, so go try it out, if you have a copy of S3&K! (also works on Mega Collection Plus, but not Classic Collection. A lot of the unusual stuff doesn't happen in that one. In Sonic & Knuckles alone, there are four different endings. Both characters have their own "good ending" if you collected all the Chaos Emeralds, and a "bad ending" if you didn't. In Sonic 3 & Knuckles, an additional five are added, with a good and bad ending for Tails and "super" endings for all three characters if they collected the Super Emeralds (i.e. both sets of Special Stages for Sonic 3 and S&K). They're all pretty much the same kind of thing though, and feature the Sky Sanctuary Zone music, before bursting into the credits megamix. 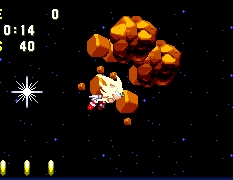 For Sonic/Tails, the character you've been playing as will be tumbling down from space, Master Emerald alongside them, and remaining in their normal/super/hyper form. If all the Chaos Emeralds were collected, it'll continue falling with the character, otherwise it'll stay in space. 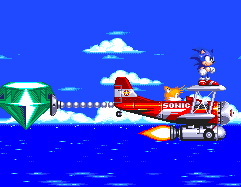 The other character will appear in the Tornado, and conveniently catch them on the wings in typical Sonic ending fashion, and if the Master Emerald is with them, a nifty grabbing device comes out the back of the plane and catches it, so that the emerald is in tow. The character returns to their normal self as soon as they land on the wing. 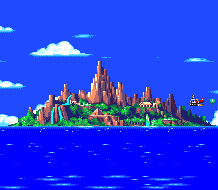 Sonic and Tails head down to the ocean and the camera pans right to see Angel Island still resting on the surface. Now further away, the plane heads across to the right and turns briefly before reappearing in the distance, behind the island. 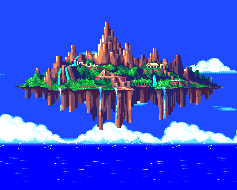 Without the Master Emerald, they'll just fly right past but otherwise, it'll be deposited onto the island, which will flash white and slowly begin to rise again, restoring itself to an airborne state. 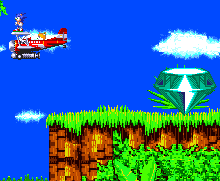 If you collected all the Super Emeralds, you'll be treated to an additional little scene afterwards in Angel Island Zone, where the Emerald is seated on a platform and our heroes are flying overhead. 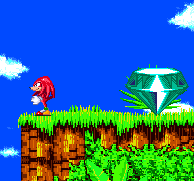 Knuckles appears and stands on the edge of the platform, looking rather grateful. As he should. During the credits, Sonic and Tails head off just above the ocean, accompanied by dolphins and birds if you got the good or super endings. At the end, Sonic/Tails will leap into a pose in their normal/super/hyper forms, as appropriate, accompanied by the game logo. Finally, on a black screen, Eggman will appear, standing by the Master Emerald looking rather smug (Eggman that is, not the Master Emerald, which is probably incapable of displaying human expressions) if you didn't get all the Chaos Emeralds. If you managed that, but didn't get all the Super Emeralds, it'll be a menacing-looking Eggrobo rising up from a pile of rubble, but if you were so amazingly awesome that you got the Super Emeralds as well, you'll be treated to a large Sonic 3 & Knuckles logo, with the sprites of Sonic, Tails and Knuckles posing in front of it. Give yourself a pat on the back. Knuckles' endings are slightly different. 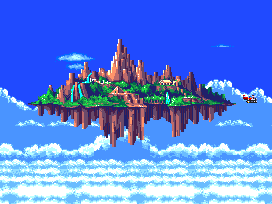 After defeating the Mecha Sonic, we see a shot of Angel Island hanging precariously in the air. 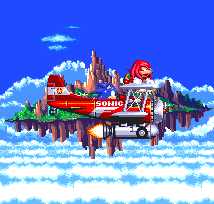 Suddenly, Knuckles pops up on top of the wings of the Tornado, piloted by Sonic. In the bad ending, Knux is tired after the battle and is panting away. 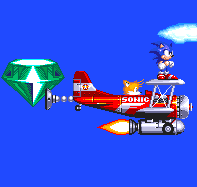 In the good and super endings, he's holding up the Master Emerald in triumph and turns to give Sonic the thumbs up. 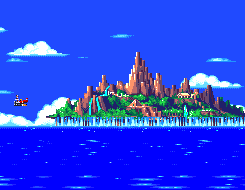 They head off to the right, then across to the left a little further away, and then appear behind the island where Knuckles is dropped off and Sonic leaves. 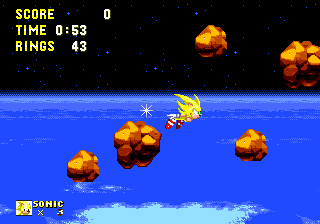 If you failed to collect the emeralds, the island will begin falling and land in the ocean by the time the credits are done, otherwise it'll flash white, stop tilting and ascend upwards. Near the end of the credits, it'll end up about as high as it can possibly go before it leaves the planet, but the camera still proceeds upwards into space, where an image of Knuckles appears out of no where, with his fist in the air, accompanied by the game logo. He doesn't see it necessary to give us a pose for the bad ending, but Mecha Sonic appears in front of a black screen at the end, and he hops onto the Master Emerald after coming back to life. The super ending is pretty much the same as the good one, except that Knuckles is flashing with awesomeness. It maybe short, yes, but remember this is part 2!! 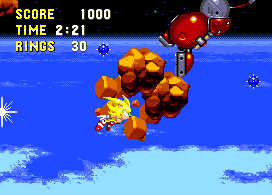 This game also contained patches for the Sonic 3 zones to make them more Knuckles friendly (especially Launch Base Zone), and some of the zones here are fudgin' huge - such as Lava Reef and Mushroom Hill. Why isn't the info about of Sky Sanctuary, Death Egg and Doomsday stages? 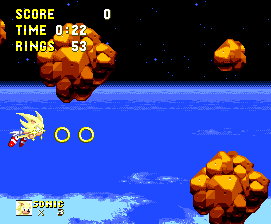 The Death Egg Zone is only playable by Sonic and/or Tails (except in Debug mode). The Death Egg looks different than it did in Sonic 2, and is also home to the final boss. Act 1 is held inside the zone, whereas Act 2 takes place outside, where the gravity gets wacky. This zone is only accessible with the first set of Chaos Emeralds, and only by Sonic. Sonic turns to Super Sonic and tries to defeat Eggman before he escapes with the Master Emerald. Death Egg zone is next and is the final zone if you do NOT have all the chaos emeralds. If you do, The Doomsday zone would be the last. But death egg only for Sonic and Tails, Sonic alone and Tails alone. 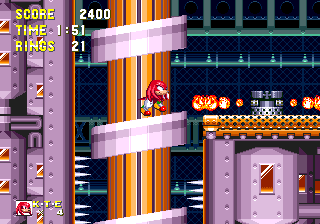 Knuckles can get there only by using the level select cheat. There are many badnicks, gravity changing, electric pipes etc. Different music to the Sonic 2 Death Egg. I've never seen those blue spikes ever or ever been hit by them.